Many Fujifilm X and GFX shooters earn their bread and butter with Fujifilm cameras, and many of those are also extremely successful in their specific genre. You also probably know Kevin Mullins, one of the top wedding photographers globally speaking, who shoots exclusively with Fujifilm X series camera. The list could go on and on (and I apologize for all those I didn’t mention here), but today it’s about Markus Klinko, a photographer, who saw his work displayed at Times Square in New York, who photographed top celebrities like Beyoncé (btw, Beyoncé shoots Fujifilm X100s, as you can see her here) and David Bowie. Markus is also a good friend of FujiRumors, and he has also contributed with several articles on Fujirumors.com. How did it happen, that you get to meet and work with David Bowie? In the summer of 2001, Bowie’s super model wife, Iman, had hired me to shoot the cover of her book, and I met him during one of the editing sessions. He must have liked what he saw, because a couple month later, he called me and ask me to shoot the cover for his album, Heathen. It was the beginning of a wonderful collaboration with both of them, that went on for over 15 years! Your “David Bowie Unseen” exhibition is having a global success. 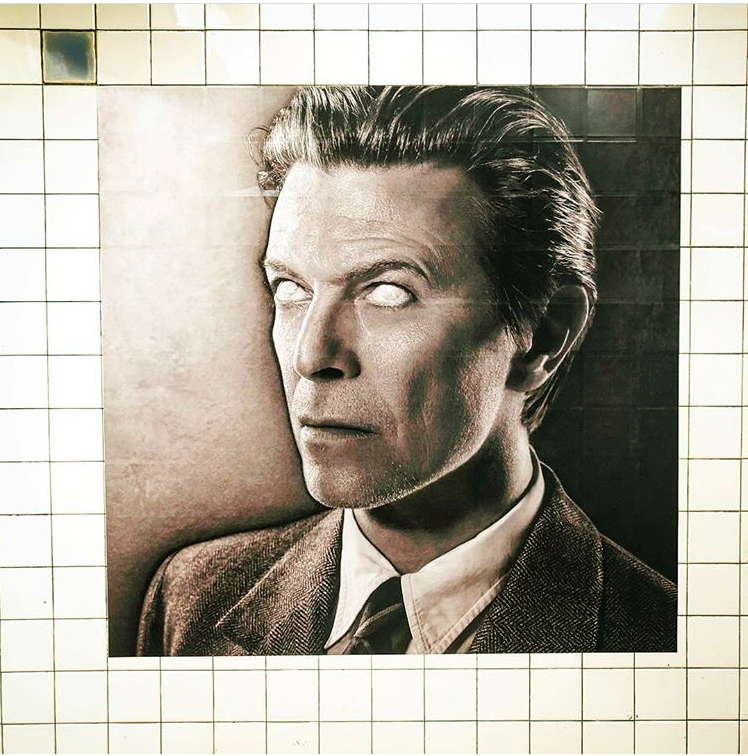 Where can people see your David Bowie images at the moment? 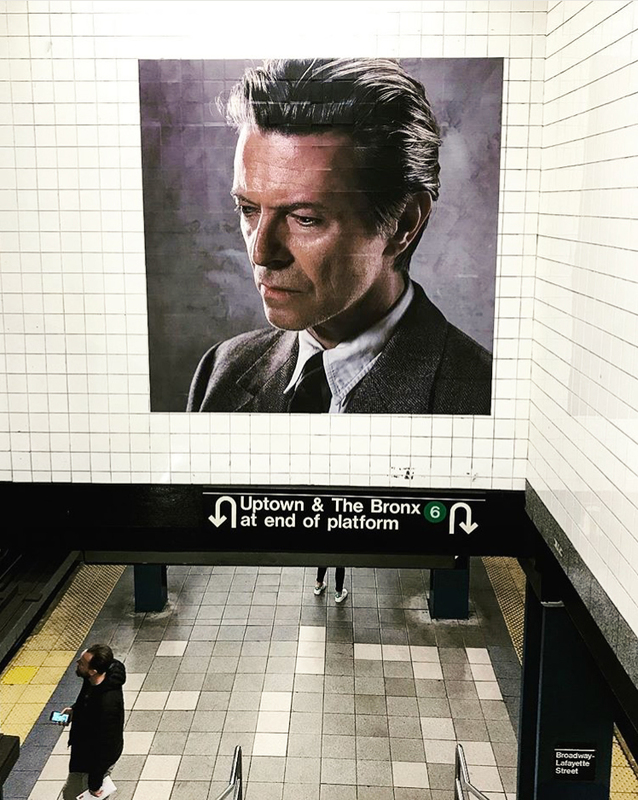 My work with Bowie can be seen in galleries around the world, but right now there are very exciting installations in NYC at the Broadway-Lafayette station [see images below]. In May, I will also be at ART NY with Lichtfeld gallery, and right after at PhotoLondon with Iconic. June is another big month for me, because I have a special featured role at Art Basel, Switzerland, and that same week, on June 14th, my brand-new exhibit, 2000s, opens at Mouche gallery in Beverly Hills, made possible by FUJIFILM! 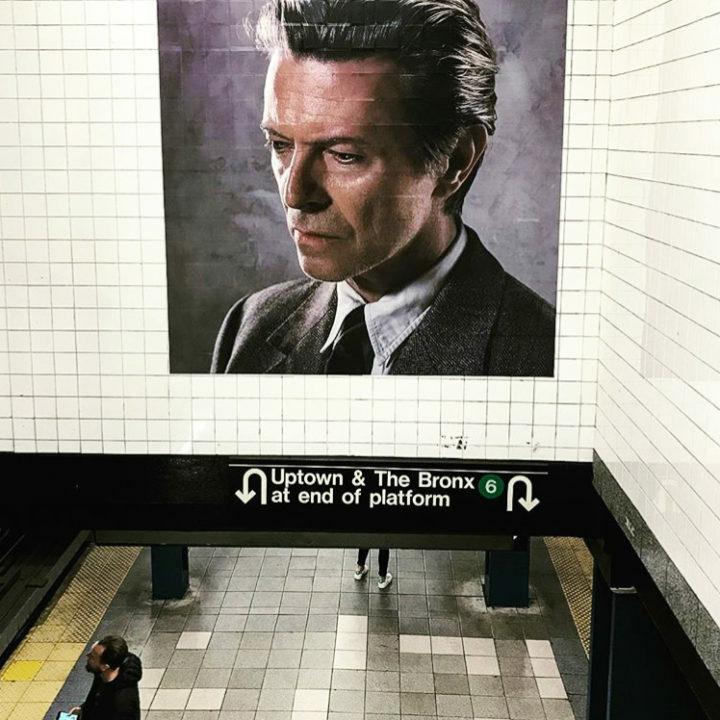 2000s will feature many of my best known images of stars like Beyonce, May J. Blige, Britney Spears, Anne Hathaway, Will Smith and of course, more Bowie! What gear did you use to photography David Bowie? All my Bowie images were shot on FUJIFILM Provia medium format film. Back in the early 2000s, I used the FUJIFILM GX680III, the incredible 6×8 format camera and Broncolor. What’s your favorite image taken with a Fuji? Whatever latest work I just shot is usually my favorite! I am very excited about my work and live in the moment! What’s the main reason for you to own a Fuji? In my opinion, the Fujifilm GFX is the best camera ever built, and by far. Fujifilm are way ahead of everyone else in terms of ergonomics for instance, and for what I do, there has never been another camera that comes even close. With the new GF250mm lens, the 1.4 converter and the new macro tubes, the system is very mature now, and covers all my needs extremely well. The 250 with the 1.4 converter, it is absolutely breathtaking. Very easy to use. Handheld, every shot is nailed, and stunning sharpness. This combo is a game changer! In addition, the new macro tubes with the GF120mm allow to go beyond 1:1, by combining the 18 and the 45mm tubes. Autofocus is very fast and accurate, which is very surprising at closest macro range. Right now, probably the GF250mm, but also the 110, the 45, and particularly the 120 macro. But than again, I really love the 23mm as well! What’s your favorite camera bag? ThinkTank! I have many of their great bags! One of my favorite ergonomic features of the GFX is the tilt and swivel, but I also love shooting with the screen flipped up in both formats. I cannot believe that some other manufacturers design a screen that only flips up in horizontal, but not in vertical. Fujifilm is just way ahead! Both, when I shoot thethered i keep the RAW on my card and only send a medium size jpeg to the computer. That is incredibly fast in that way.